Hosted email refers to email accounts that are hosted and managed from the domain (as opposed to a third party internet service provider like Hotmail, Google, etc.) The advantage of hosted email is that it allows email to be sent from the website domain (i.e. sales@yourdomain.com). Hosted email is more professional than an outside email address (i.e. yourcompany@aol.com). Forwarding – A forwarding email account immediately sends mail as it arrives to another mailbox, like a personal email address. Forwarding is a quick and easy way to set up email. However, when replying to email using your personal account, the return address (the From Address) will show the personal email address instead of the domain email. Pros: Quick and easy, only one place to read email. Cons: Replies to email are "From" the address that all mail is forwarded to, unless this is overridden in the email program, not in HotDoodle webmail, but the account to which it forwards. Also, is subject to the reliability of the destination email address. Pros: HotDoodle stores the email and offers webmail. Replies are "From" the new email address. Cons: Requires checking email from multiple accounts unless configured in an email program to send them all to one place. Configuring for email programs may require complex and difficult to comprehend technical email account setup screens in the email program. Also, some internet connections (the ISP) may block sending the mail. Also the mailboxes may fill up. You request an email setup via the config emails form described below. Email setup is easy, email transfer can be a challenge. Only New Emails are transferred: When moving hosted email to HotDoodle, all old email from before the service transfer will remain on the original server and only newly arriving email will be delivered to and held on HotDoodle's server. The only way to have old email and new email all saved at the same place is to have a third party email program like Outlook download email from both servers and save it outside of either server. There are days of instability: Changing the email server requires a domain settings change, and these take days to propagate worldwide. In the meantime, some email is arriving at the old server, some at the new. 4. Under the Site Manipulation heading, click on the "Config Emails" link. 1. From the HotDoodle Toolbar, click on "Administration." If an email hosting account is not setup yet, complete the initial setup form. 2. Fill in the form to request the initial hosted email setup. 3. Click on the "Save" button. HotDoodle will send an email when the hosted email accounts are ready. 2. Press the "enter" key on the keyboard. 3. On the next screen, enter the login ID and Password assigned for the email to view. 4. Click on the "Login" button. 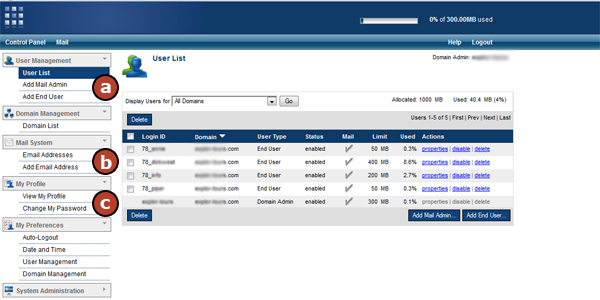 Only the Email Administrator can add and remove End Users and Email Addresses. a. Add End User - Creates an true email mailbox on the server to hold email. 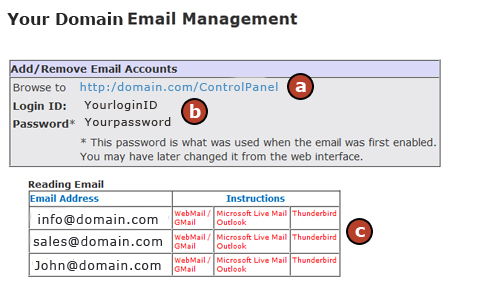 See illustrated example of adding a new email account. b. Add Email Address - Creates a forwarding email address. HotDoodle gives the ability to have many email addresses forward all mail to one End User so that all mail can be checked from one login. c. Change My Password - Allows changes to a login password for an End User. Please see the Email Examples page for illustrations on adding an email account, reading the client setup instructions, or configuring some common email clients. In an effort to keep spam from being sent over their networks from customer computers that get infected with a virus, some ISPS (internet service providers) block sending emails from any server other than their own. This is known as the "Port 25 blocking" issue. Click the links below to read more information on Port 25 blocking to determine if you are using an ISP that blocks port 25. These links explain how to detect if your port 25 is blocked. This link lists some ISPs that block port 25 and what servers to use instead. This link provides more information about port 25 blocking. This link provides AT&T specific info on port 25 blocking. This link explains enabling Telnet on Windows, which is needed to test port 25. This link provides workarounds for port 25 blocking.